The federal government is well aware of the questionable practices by many unlicensed “debt consultants” in Canada, yet they seem to be doing little other than issue consumer alerts and reports. Hoyes Michalos has written many blog posts, social media posts, and letters to our government in an attempt to spur some kind of action that will protect consumers from debt consultants who charge exorbitant, unnecessary fees to unsuspecting debtors to “help” them file a consumer proposal. Yet debt consultants are still actively operating without bounds. We just recently began working with a client who experienced the horrors of dealing with a company who she signed a contract with to help her through the consumer proposal process. Our client (who came to us on her own, not referred through a debt consultant), gave us permission to publish these documents she received and to share her story about her struggle with debt. 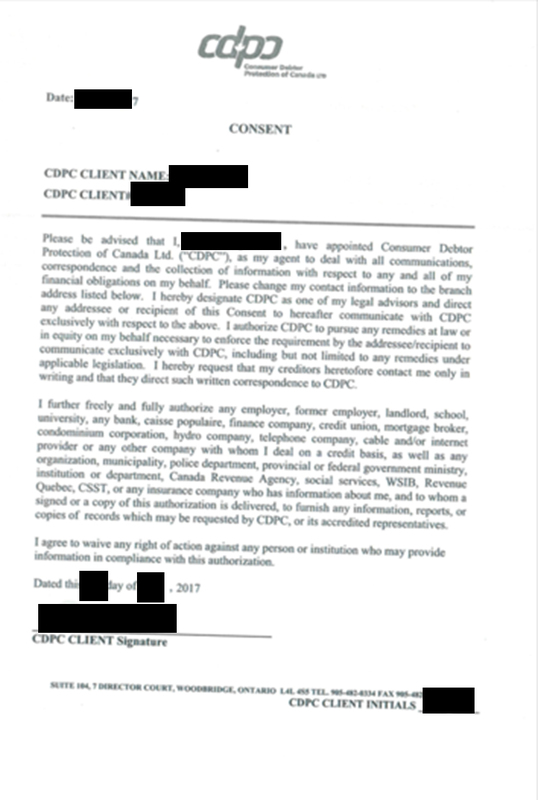 She reached out to Consumer Debtor Protection Services of Canada (CDPC) for help. As is normal for debt consulting companies, they required that she sign a contract for their services before doing anything. What’s even more alarming to me is the additional agreements she signed as part of the process. 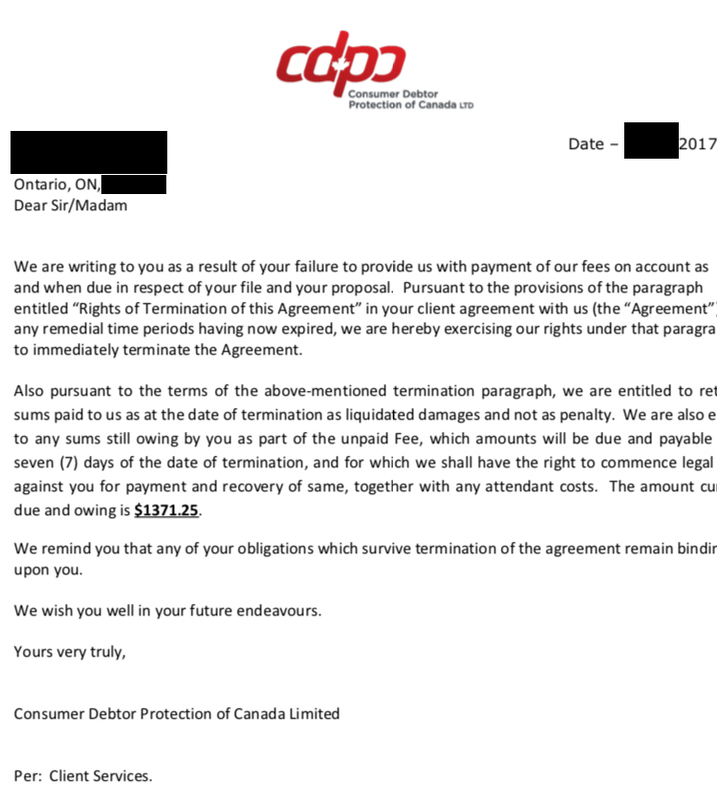 As you can see from the image below (client information removed), the terms of this agreement are somewhat alarming as the people of CDPS can contact on behalf of the debtor. I further freely and fully authorize any employer, former employer, landlord, school, university, any bank, caisse populaire, finance company, credit union, mortgage broker, condominium corporation, hydro company, telephone company, cable and/or internet providor or any other company with whom I deal on a credit basis, as well as any organization, municipality, police department, provincial or federal government ministry, institution or department, Canada Revenue Agency, social services, WSIB, Revenue Quebec, CSST, or any insurance company who has information about me, and to whom a signed copy of this authorization is delivered, to furnish any information, reports, or copies of records which may be required by CDPC, or its accredited representatives. This seems like overkill to me to help someone deal with some debt and in all likelihood refer them to a Licensed Insolvency Trustee to file a legal process on the client’s behalf. What’s worse, is these agreements were delivered and signed via email. I’m not sure how well most people understand exactly what they as signing under conditions of stress and concern about debt problems when they are presented over the phone or email. After paying $1,200 in fees and finding herself still in debt, with no foreseeable solution, our client came to see our Licensed Insolvency Trustee, Rebecca Martyn, in our Windsor Ontario office. This client has since chosen to file a consumer proposal with us. Now she is being sued for “liquidated damages” of another $1,371 by Consumer Debtor Protection of Canada. Luckily for her, this debt will be included in her consumer proposal. While the government may not be doing enough to remove unlicensed debt consultants from the industry, I’ll once again provide a clear warning about debt consultants: They often charge money for a service that is not necessary and do not solve your debt problems, and their fees can reach thousands of dollars. The Financial Consumer Agency of Canada (FCAC) is warning consumers who can no longer keep up with their debt payments to be cautious. Some companies are misleading consumers by promising quick and easy solutions to help pay off their debt or repair their credit. In some cases, consumers may end up in a worse financial situation than before they got help. You do not need to pay a fee to see a Licensed Insolvency Trustee. ONLY Licensed Insolvency Trustees can file a consumer proposal. A debt consultant cannot get you a better deal in a consumer proposal. Licensed Insolvency Trustees are federally regulated, as are our fees. Speak directly with a Licensed Insolvency Trustee. This client now wishes she had come straight to us in the first place, but hopefully this experience can help others make the right decision at the start of their journey towards becoming debt-free. Who Do Licensed Insolvency Trustees Work For? What is a Registered Consumer Proposal?